This is a copy of John Evelyn's plan for the rebuilding of London after the fire, published by the Society of Antiquarians in 1748. Evelyn was among the first with a design for the rebuilding, although he cheerfully admitted that ''Dr [Christopher] Wren had got the start on [him]''. 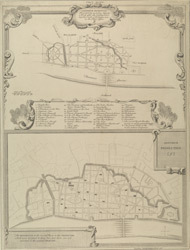 Evelyn's plans were similar to Wren's in that both show a preference for a grid-pattern street plan, together with diagonal intersections and piazzas. Like Wren, Evelyn favoured an octagonal piazza on Fleet Street. In all, Evelyn's plan features 12 interconnecting squares and piazza's. Evelyn also proposes that the Royal Exchange be moved from the centre of the city to a riverside piazza on the site of the present Cannon Street station. Perhaps to flatter the Charles II, Evelyn proposes a new gate in London Wall called ''King Charles Gate.'' Evelyn's plan, like Wren's, was never built. It was "a capriccio rather than a practical panacea," he said.